Adolf Hitler was born on 20 April 1889 in Braunau-am-Inn on the Austrian-German border. His father was a customs official. Hitler left school at 16 with no qualifications and struggled to make a living as a painter in Vienna. This was where many of his extreme political and racial ideas originated. In 1913, he moved to Munich and, on the outbreak of World War One, enlisted in the German army, where he was wounded and decorated. In 1919, he joined the fascist German Workers' Party (DAP). He played to the resentments of right-wingers, promising extremist 'remedies' to Germany's post-war problems which he and many others blamed on Jews and Bolsheviks. By 1921 he was the unquestioned leader of what was now the National Socialist German Workers' Party (NSDAP or Nazi Party). In 1923, Hitler attempted an unsuccessful armed uprising in Munich and was imprisoned for nine months, during which time he dictated his book 'Mein Kampf' outlining his political ideology. On his release he began to rebuild the Nazi Party and used new techniques of mass communication, backed up with violence, to get his message across. Against a background of economic depression and political turmoil, the Nazis grew stronger and in the 1932 elections became the largest party in the German parliament. In January 1933, Hitler became chancellor of a coalition government. 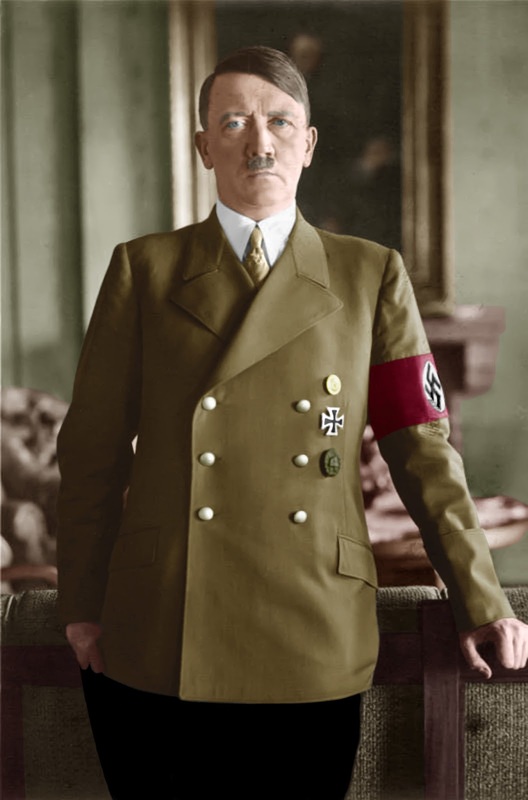 He quickly took dictatorial powers and began to institute anti-Jewish laws. He also began the process of German militarisation and territorial expansion that would eventually lead to World War Two. He allied with Italy and later Japan to create the Axis. Hitler's invasion of Poland in September 1939 began World War Two. After military successes in Denmark, Norway and Western Europe, but after failing to subdue Britain in 1941, Hitler ordered the invasion of the Soviet Union. The Jewish populations of the countries conquered by the Nazis were rounded up and killed. Millions of others whom the Nazis considered racially inferior were also killed or worked to death. In December 1941, Hitler declared war on the United States. The war on the eastern front drained Germany's resources and in June 1944, the British and Americans landed in France. With Soviet troops poised to take the German capital, Hitler committed suicide in his bunker in Berlin on 30 April 1945. Cruelty impresses, people want to be afraid of something. They want someone to whom they can submit with a shudder, the masses need that. They need something to dreed. A single blow must destroy the enemy... without regard of losses... a gigantic all-destroying blow. Demoralize the enemy from within by surprise, terror, sabotage, assassination. This is the future of war. By the skilful and sustained use of propaganda, one can make a people see even heaven as hell or an extremely wretched life as paradise. Do not compare yourself to others. If you do so, you are insulting yourself. Great liars are also great magicians. Anyone can deal with victory. Only the mighty can bear defeat. Humanitarianism is the expression of stupidity and cowardice. I do not see why man should not be just as cruel as nature. It is not truth that matters, but victory.